If this all sounds like a lot of work, do like Betty and maximize your kitchen time by preparing a freezer meal when you’re already cooking. You may be surprised at all you can get done after you put tonight’s dinner in the oven or while you’re waiting for the pasta water to boil. Here are some more tips for mastering make-ahead cooking. 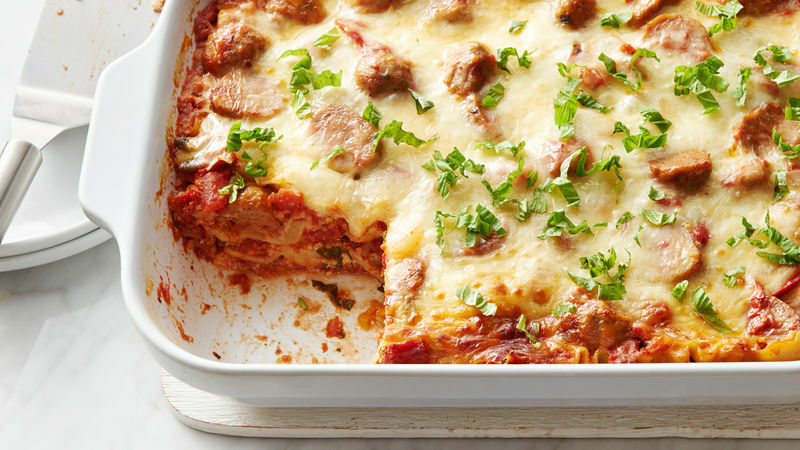 Add ingredients for one make-ahead meal to your weekly grocery list each week. This way you’ve got a stockpile that’ll simplify dinner during your busiest weeks. When your garden goes wild or you get a great deal at the store, take the extra ingredients and prep them for easy cooking later. This might mean turning your extra basil into pesto, so you can whip up a pasta dish in the time it takes to boil water. Or, it might mean making a batch of crispy chicken cutlets when you get a good deal on the family-sized bag of chicken breasts. When wrapping up a freezer meal or meal component, always let the food cool completely. Then, wrap food in plastic wrap, foil or freezer containers and label the item with the date it was made. Containers that work well for freezing include: zip-top plastic bags – look for the ones made to be put in the freezer, they’re made of thicker plastic that’ll hold up better – and plastic containers with tight-fitting lids. To prevent freezer burn, remove as much air as possible from the package. To learn even more about make-ahead meals, check out this article about turning frozen meal-starters into dinner. Then become an expert in freezing food with Betty’s articles on the foods you should (and shouldn’t) freeze, how to freeze fresh fruit and how to freeze cookies. Feel free to leave a comment below. We’d love to hear your questions and comments about make-ahead meals.